Today, son is done with his examination for the year. Looking back, time seriously just flew past in the blink of an eye. He will very soon embark on a challenging year next and I believe a stressful year for the parents too. I am praying hard now that he will “wake up” from his slumber and give his 100% by then. Was told that by 16, maturity will starts to set in and hopefully he will be more self motivated and able to find his goal in life. Next year, I predict will be a very tough year for me as well. Son is sitting for his “O” level and daughter is adjusting to Primary 5 life. Was told by all her tutors that they are expecting a tough year and we have to prepare our kids in order for them to be comfortable with PSLE! Yikes! In fact they are all taking this Nov and Dec to prepare the kids as the difficulty level jumped tremendous from primary 4 to primary 5. All of them frowned upon my year end plan. It is like “you must be kidding to do this?” When we get back, we will have to work doubly hard or more to catch up. Nevertheless, I am focusing on my girl now. Every encouragement will give her that confidence level to do her best. Two more weeks to go and we will be free! Yes! Now let’s me share with you this absolutely delicious dessert that we will be having later. 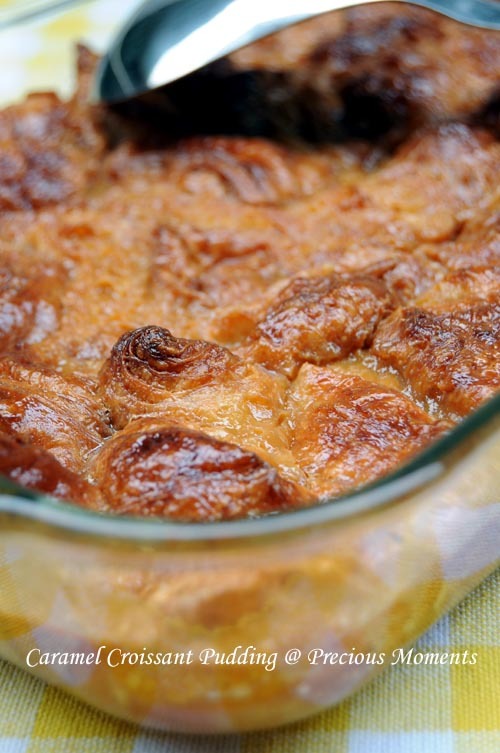 Caramel Croissant Pudding. Believe me it is finger lickin good! I bet you never see such a flat pudding before, since this is my first time baking such pudding, I didn't know it will deflat upon cooled. I should have used a smaller and deeper baking casserole instead. Helper and I totally agree that this is delicious. Now I will wait for my man and kids to judge later. Melt sugar and water and continue to simmer till it turns amber. Slowly pour in the cream. Stirring constantly till sugar is fully incorporated into the cream. Add in rum and milk. Stir well. Add in beaten egg and continue to heat till semi thicken. Pour into the croissant and let it sit for 10 mins. Bake in 180 deg for 20 mins or till golden brown. 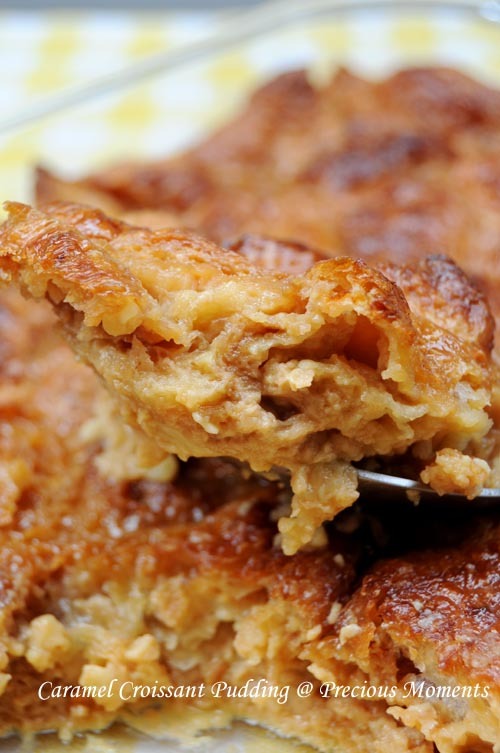 When I make bread pudding with croissants or brioche my husband's family finds it too rich! They like it traditional, made with plain white bread and milk instead of cream... Lol. Isn't the system just ridiculous... That you can't enjoy your year-end holidays too much as a family, because the kids have to rush back to school for preparations for next year's syllabus? If this doesn't spell something wrong, then I really don't know what does. I have problem with our education system all along but I was told that I should move with time. So I rest my case. I failed to see why majority of the children are being robbed of their childhood just to sift out that small group of "smartty". what a great way to relieve some of those academical stress! My girl is in P4 till year but she is already being warned that P5 is like hell. So I still have another two years of stress! 5 years ago, I didn't even have to worry so much. Crazy. Actually I only started getting stressed up with my girl coz within that 5 years, the expectation from the education system leaped tremendously.